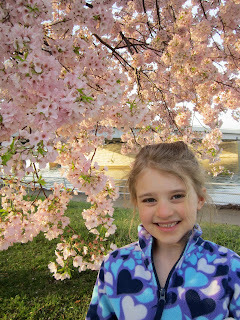 This morning we got up at 5:45am to leave the house by 6:15am to drive into DC to see the Cherry Blossoms around the Tidal Basin. We have lots of Cherry Blossoms around our house, but there's something very special to see them in DC with all of the monuments, memorials, and water surrounding them! We are very lucky to live in such a beautiful city, and this morning we got up super-early to take advantage of living here! This morning we behaved like tourists! When were you last a tourist in your town?